Eight Ways To Pray For Our Public Schools. Please pray for our public schools! Usually I reserve the Prayer blog in Grace on Parade for ways you can pray for my writing and bible study ministry. This week, I want to share a need that has consumed my thoughts. It concerns the tangled mess of our public schools and the children who attend them. As I listened to her, I remembered the Bible story of the Egyptians’ oppression of the Israelites who required them to make bricks without straw. That’s the situation in which many of our public school teachers find themselves—expected to accomplish certain results without adequate resources or authority. I’ve seen a lot of complaints on Facebook and other social media about our school systems—about Common Core, teaching to the test, the inability to discipline, and schools who won’t teach cursive writing. These issues are the tip of the iceberg. Our family units are crumbling and kids bring their dysfunction into the classroom. Some school districts operate under the thumb of a corrupt state government out of touch with classroom reality. In the midst of this, there are a lot of good-hearted teachers struggling every day to keep their heads above water and teach in a way that satisfies their consciences. Pray for strength, endurance, and wisdom for the teachers. Pray for revival among the students. Pray the Lord of the Harvest to bring forth a large bountiful yield among our public school students. Pray that God will grab hold of the hearts of those students who have already learned the art of evil and transform them into God-fearing teens. Pray for the many “good kids” to remain on the path of righteousness, to be strong in Christ, but to also be humble and loving to those that aren’t. Pray for Christian parents who will also mirror Christ to teachers, administrators, and other students. Pray for the teachers who are Christ-followers, and that they will love their students so that even without a word, they might display the light of Christ to those who are searching. Many Christ-following teachers, like this one, view their job as a ministry and their audience as a mission field. Pray for the administrators. Pray that God will raise up more believing administrators and that they will act with courage, creativity, and wisdom. Pray that God will place his people in high places, and that they might be like Daniel to this generation. Pray that God will move in the minds and hearts of government officials to release the schools from unreasonable expectations. In all things, look for the good and thank God for the pockets of faith, kindness, goodness and success that you do see. We need to let teachers and administrators know we are praying for them. We need to do this in a supportive, non-judgmental way. We need to become known as people who, when they see a problem, pray instead of gossip. I encourage you to find a Moms In Prayer International group in your area. This is a non-profit, para-church organization whose sole purpose is to pray as a group for their local schools. Many locales have separate groups for grandparents. If you don’t see any local groups in your area, consider starting one or encourage your church leadership to include prayers for your community schools in your church prayer time. Christian schools are not the solution. Transformation of our public schools is the solution. Let’s be light and salt instead of hiding our lights under the bushel of the private school. But the best thing you can do is to pray. Prayer is our greatest weapon. 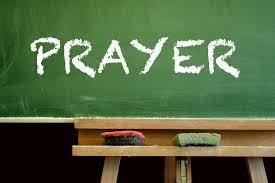 School systems may think they can prohibit prayer inside the classroom. They cannot keep those on the outside from forming a wheel of prayer around them. Please take a moment right now and pray for your local school and any teachers or students you know. May God bring healing to our public schools! Thank you for this wonderful post, Karen. Teachers do need prayer. I taught for 30 years and the expectations of teachers now is not what it was when I started. Not only have the tests and paper work increased tremendously, but the climate in the classroom has also changed. How can you teach children who have not been taught respect? How can you teach children who take no responsibility in the learning process? How do you teach children who are disruptive and threatening to the teachers and students? How do you teach children whose parents do not value an education? How do you teach children who are not in attendance on a regular basis? How do you teach children who have an unstable home, are hungry, and don’t get enough sleep? I would like to add another prayer. Please pray for the parents that they will know the value of an education and learn how to nurture their children. May God enter their lives and show them the way. Thank you so much for your insights. And thank you for your years of service as a teacher.